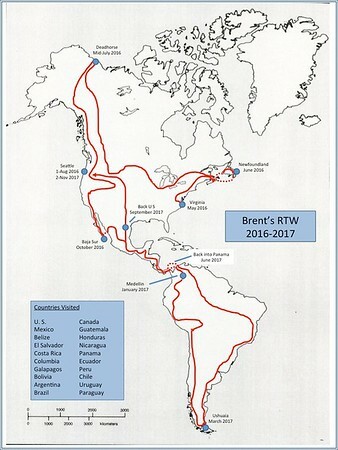 My name is Brent Carroll and this series of blog posts is about a grand adventure I took in 2016-2017 on my motorcycle… alone… to some pretty remote places on our planet. 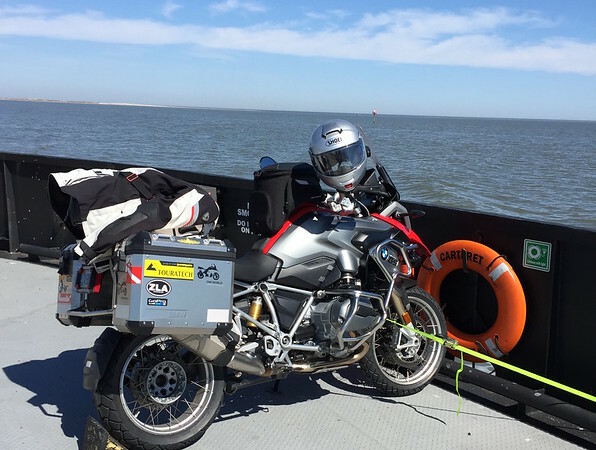 I dropped everything – put everything I owned in storage, got out of a house, and took off, living on my trusty BMW across 15 countries for 13 months. The posts are broken down by episodes, much like chapters in a book, so at the bottom of each page, just hit “Next Post” to keep reading. For each episode, I also produced a video, which beyond showing live action shots, also let’s you hear my voice, get a sense of the environment I traveled through and the people I met, and share my ups and downs. The write-ups and videos should be seen as complimentary. Thanks for reading, and I hope you enjoy. As I do with each new installment, I provide a video log via YouTube if you’d prefer that medium, although I do try to add some interesting tidbits in the writing. So, who am I and what possessed me to do this? Well, as I said my name is Brent. I have been living in Chesapeake for the last 14 years. I grew up in Charlotte, North Carolina and joined the Navy right out of high school. In the Navy I was a submariner and later a Surface Warfare Officer. I stayed in Chesapeake after retiring from the Navy in 2007 and then started work with the U.S. Coast Guard as a federal employee. I have always enjoyed exploring new places. But, and it’s funny to think about now, but a little over a year before leaving on this trip I didn’t even own a motorcycle. I am a bit jumpy, maybe, I don’t know. One day, a friend of mine posted some pictures to Facebook of he and his girlfriend riding two and going on a camping trip. This was the exact picture that lit my fire. Those pictures led me to buying a bike of my own within a couple of weeks! I had no idea what I was doing. So, I spent some time getting to know people with a local riding club. And then I discovered Horizon’s Unlimited and I was hooked into a new lifestyle I didn’t really know existed – adventure motorcycling. I think adventure is best defined by losing oneself in your surroundings, being vulnerable and open-minded about new places and the people that you meet. When you combine that with the liberating sensations and thrill of riding a motorcycle with everything you own strapped to it, it makes for a wonderfully powerful combination. 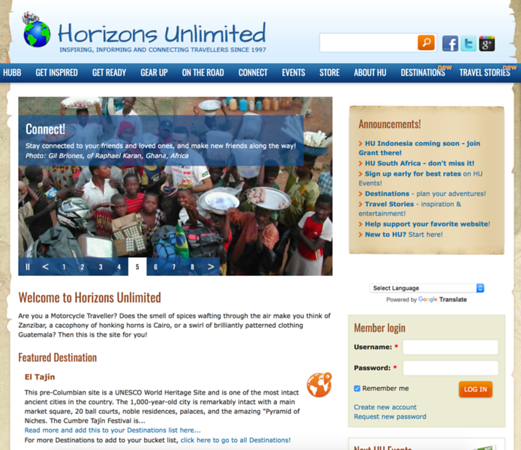 When I met Grant and Susan in 2015, the great pair that started Horizon’s Unlimited, at a gathering in Appomattox, Virginia, they set my life on a trajectory that would change me forever. 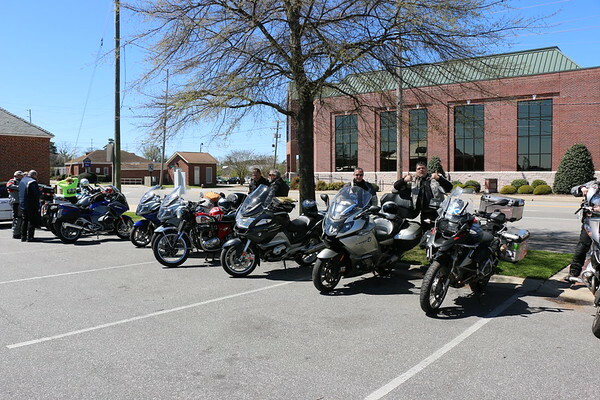 A year after that meeting, I left on my own extended travel by motorcycle. So, I spent an entire year preparing for this trip. Looking back, it was absolutely necessary to spend that much time preparing as there are so many things to think about – finances, what about your mail? 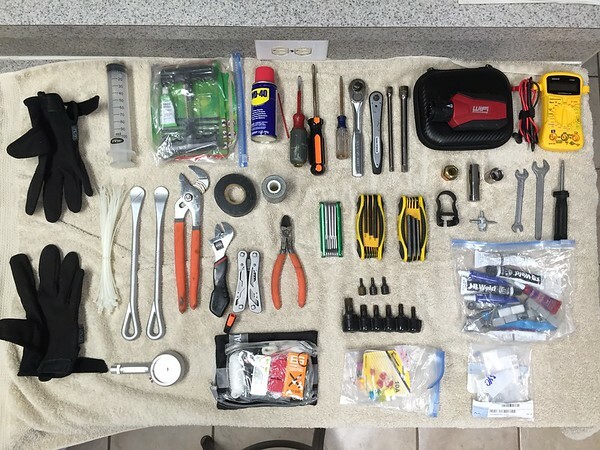 Your bike documentation? Insurance? What to take and not to take? How to ride a motorcycle off road? It was overwhelming to think about, and the list of preparations was very long. I am not even sure where to start. OK, maybe the route would be a good place to start. I spent a lot of time thinking about what was possible and settled on the Americas. It was accessible, familiar enough to me that I could see the whole picture in my mind, and chock full of so many varied places I had never seen firsthand before. 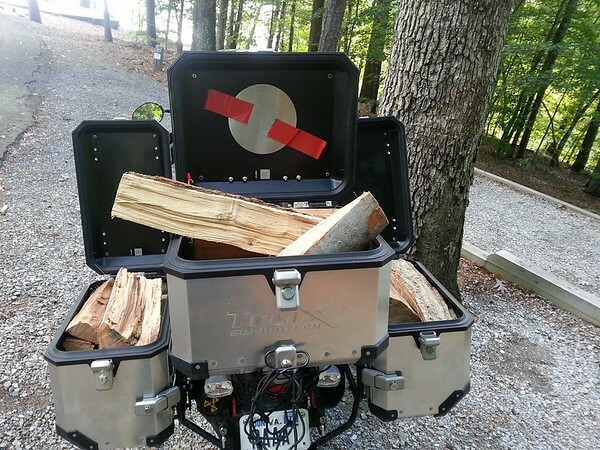 The plan was to travel through 20 countries in North, Central, and South America. Wait, Central and South America. They speak Spanish there (mostly). 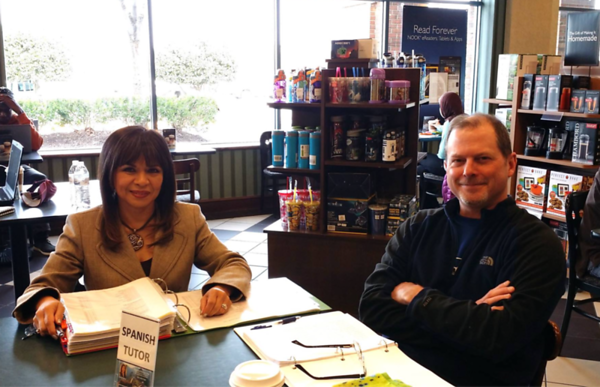 I needed to learn Spanish, so I enlisted the help of a tutor. This is Myriam and I sitting at a Barnes and Noble during one of our lessons. I took lessons for about 6 months and learned a great deal, so much so that I was very comfortable with my conversational Spanish. 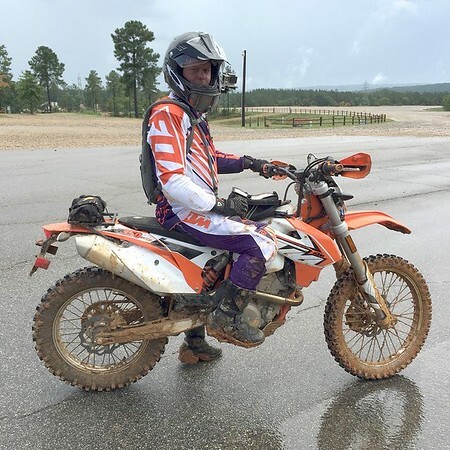 Another big hurtle for me was that I expected some bad roads in places along my route, but I had not a clue about how to ride “off road.” I took a 2-day course at the BMW facility in Greer, SC, and also bought a second motorcycle just to get some practice. The KTM ended up being so much fun to ride I thought of kicking myself for waiting so long in life to get one. Finally, my comfort level was rising. What tools to take? Jeez, this took forever chatting with people in forums about the tools I might need if stranded by the road in the middle of nowhere. Gear selection also became a huge chore. 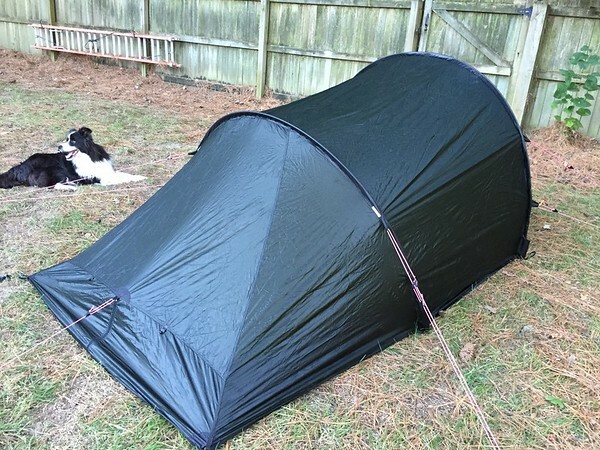 This is the third tent I bought and tested before settling. I tried to buy gear that was top quality as I didn’t want to have to replace things on the road. Just before leaving, I learned that I had been chosen as a Jupiter’s Traveler. 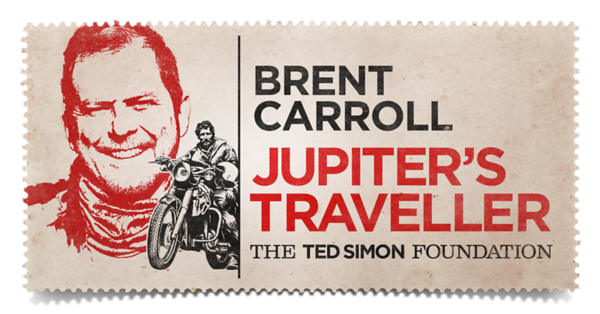 Ted Simon’s famous book, Jupiter’s Travels, chronicled the author’s life altering experiences while travelling around the world for four years on a Triumph. 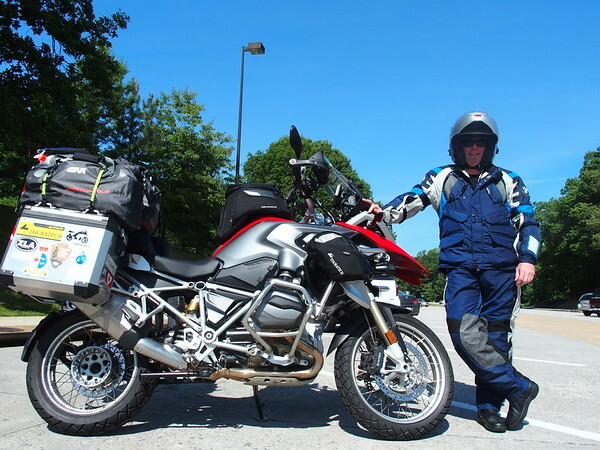 He’s considered by many to be the father of modern-day motorcycle adventure travel. 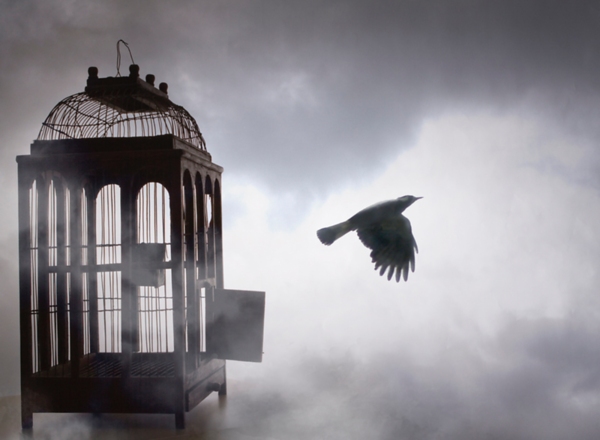 The point of this foundation is to publicize the good in the world form those experiencing it first-hand thereby attempting to overcome the stereotypical, over generalized notions that people have about the world. So, in that sense, it was my job now to tell it like it is, through my own eyes. In the end, though, I finally made these and countless other preparations and the day finally arrived. I was off on my grand adventure.